Hello Latisha here with you today, to share a fun and easy way to dress up a plain gift bag, the kind we all have lying around. 1. Using your favorite color of Creative Photo Corners, create a border at the bottom of the bag by aligning them across the bottom edge, with the flat edge along the bottom of the bag. Trim off excess off the sides. 2. Die cut cream cardstock with a round, decorative die. 3. Using the 4×6 Adhesive Sheets, place the sheet over plain cardstock. 4. Die cut a butterfly using the cardstock that has the Adhesive Sheet on it. 5. Remove the butterfly die cut, and peel the top liner off to reveal adhesive. 6. 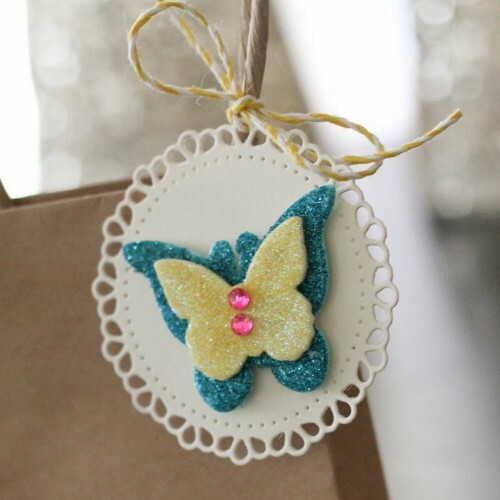 Sprinkle glitter over the adhesive on the butterfly, tap off excess. 7. Adhere the die cut butterfly to the round die cut from step 2, using 3D Foam Squares. 8. From 3D Foam Butterflies, peel the top liner off of one shape, sprinkle with glitter and tap off excess. Remove from the sheet and apply on top of the glittered die cut butterfly. 9. Tie the round round die cut to the bag using twine. Ribbon would work as well! This entry was posted in 3D Foam Shapes, 3D Foam Squares, 3D Projects, Adhesive Sheets, Adhesives, Beginner, Crafts & Tutorials, Creative Photo Corners, Gifts, Party Favors, Permanent Adhesive, Seasonal Craft Ideas, Skill Level, Tutorial, Wear your Adhesive on the Outside and tagged 3D Foam Butterflies, 3D Foam Squares Regular White, Adhesive Sheets 4x6", Clearsnap, Creative Photo Corners Black, Creative Photo Corners Mix Pack, Die Cut, Gift Bag, Glitter, Latisha Yoast, Lawn Fawn, Spellbinders Paper Arts, Tag, Tutorial, Twine, Wear Your Adhesive on the Outside. Bookmark the permalink. 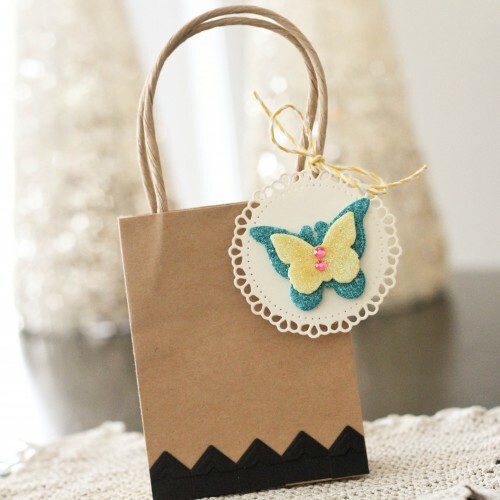 One Response to "Easy Gift Bag and Tag Tutorial"
What a sweet tag great job!